God's Promise to Israel: "The one lamb thou shalt offer in the morning; and the other lamb thou shalt offer at even: And with the one lamb a tenth deal of flour mingled with the fourth part of an hin of beaten oil; and the fourth part of an hin of wine for a drink offering. And the other lamb thou shalt offer at even, and shalt do thereto according to the meat offering of the morning, and according to the drink offering thereof, for a sweet savour, an offering made by fire unto the Lord. This shall be a continual burnt offering throughout your generations at the door of the tabernacle of the congregation before the Lord: where I will meet you, to speak there unto thee. And there I will meet with the children of Israel, and the tabernacle shall be sanctified by my glory. And I will sanctify the tabernacle of the congregation, and the altar: I will sanctify also both Aaron and his sons, to minister to me in the priest's office. And I will dwell among the children of Israel, and will be their God. And they shall know that I am the Lord their God, that brought them forth out of the land of Egypt, that I may dwell among them: I am the Lord their God." Ex. 29:39-46. (1) The Eternal Father's glory was made manifest at Sinai in the third month (Ex. 19:1) at the giving of the law (both the ceremonial, and the ten commandments on two tables of stone), and the ordination of Moses as His Vice-gerent (Ex. 19). (2) If Israel would keep their appointment with Him at the two sacred hours of prayer: the morning and evening sacrifice at the 3rd hour – 9:00 a.m., and the 9th hour 3:00 p.m., He would meet with them at the door of the tabernacle, and would sanctify the altar, the tabernacle, the congregation, and the priests, Aaron and his sons. This covenant promise that God will literally "dwell among the children of Israel," was not only to Israel after the flesh in the days of Moses and Aaron, but also to Israel by the promise, the apostolic church, and even to the church in our day. Certainly, when the future purified church, the 144,000, stand on Mt. Zion with the Lamb before the 1,000 years (Rev. 14:1-5), the presence of God's glory will be witnessed at the door of the congregation at the time of the morning and evening hours of the "Daily" sacrifice. These meetings (the morning and evening) are continual; not to offer the lambs as in the type (Ex. 29:39,41), but to offer the oblation (the bread and the wine, Ex. 29:40) that Jesus reinstituted on the night of the Passover with His apostles (Luke 22:15,19,20). Ellen G. White says, in the Spirit of Prophecy: we should partake of the emblems of Christ more often than once a year on the night of the Passover. Then, why not serve the emblems (the bread and the wine) at the headquarters of the church, "Daily," continually? This is a requirement of God in order that we may meet the conditions to receive the presence of God's Glory made manifest in pre-Pentecostal power. The little horn that waxed exceedingly great in 538 A.D. took away the "Daily;" hence, the glory from the Christian church and established his own sanctuary and a pagan priesthood, with pagan ceremonies and moral laws, or papal service, and Sunday worship. Read Daniel 8:9-12. We see by the weight of Scriptural evidence that the observance of the "Daily" is mandatory in the reception of the gift of the Holy Spirit by the church. We need to restudy the typical ceremonial system and do what it says, leaving off those things, as Paul says, "that was against us." Col. 2:14. For example, tithe paying is taught by the ceremonial or Levitical law (Lev. 27:30) and is not "against us." Then, we will have the true form of worship and God will meet with us and we will be glorified. "And the Gentiles shall see thy righteousness, and all kings thy glory: and thou shalt be called by a new name, which the mouth of the Lord shall name." Isa. 62:2. The covenant promise concerning the "Daily" is continual, day after day, in the Sanctuary above. Our Messiah offers His blood now for all Israel "Daily." Since Israel is scattered over all the earth, the Son of the Most High atones with His Own blood, in the Holy Place of the Sanctuary in the heavens, in each time zone at nine and at three. "Our Saviour was not to be sacrificed a second time; and it is only necessary for those who seek the blessings of his grace to ask in the name of Jesus, pouring forth the heart's desire in penitential prayer. Such prayer will bring before the Lord of hosts the wounds of Jesus, and then will flow forth afresh the life-giving blood, symbolized by the flowing of the living water for Israel." – Patriarchs and Prophets, p. 411. The Seventh-day Adventist Bible Commentary, Vol. 4, pp. 842-843, states that among Bible students there are "three main views" that are held about the taking away of the "Daily" in Daniel 8:11. There are among the Seventh-day Adventist ministry those who hold different views and since they are not unified on the subject of the "Daily" they say: "Perhaps this is one of the passages of Scripture on which we must wait until a better day for a final answer." Ibid., p. 843. That time has come, and the answer to Daniel's vision of Chapter 8:11 is here, God hath said: "He giveth wisdom unto the wise, and knowledge to them that know understanding: He revealeth the deep and secret things: he knoweth what is the darkness, and the light dwelleth with him." Dan. 2:21,22. No Scripture is too difficult for God's understanding since God's Holy Spirit is the author of every word of Inspiration. The wise virgins shall know of the doctrine whether it be of God. And "He revealeth his secret unto his servants the prophets." Amos 3:7.
away the 'daily,'" and since of this Scripture the Bible Commentary says, "We must wait until a better day for a final answer," it is evident that another prophet must come after Ellen G. White to explain, "Taking away the 'Daily,'" of Daniel 8:11, as well as many other prophecies that the church does not understand. For a better day and the final answer to Daniel's 8:11, the Lord says, "Remember ye the law of Moses my servant, which I commanded unto him in Horeb for all Israel, with the statutes and judgments. Behold, I will send you Elijah the prophet before the coming of the great and dreadful day of the Lord." Mal. 4:4,5. Here is the last promise of a prophet in the Old Testament for the last days. And when he comes he admonishes all to remember the law of Moses. The word, Elijah, means twice God. El, God of the Old Testament, and Jah, God of the New Testament. The I in the proper noun joins Inspiration of the two Bibles. The key is found in the Old Testament, contained in the law of Moses. The "Daily" is a part of the ceremonial law of Moses, and this is one reason we are admonished to remember the ceremonial law of Moses. The 144,000 are to sing the song (law, Deut. 31:15-30) of Moses and the Lamb (Rev. 15:3). The law of Moses is the Sanctuary law, and the sacrifice of animals pointed forward to the sacrifice of God's Son, the Messiah, as shown in God's great plan to redeem lost man. The law (song) of the Lamb of God is the ceremonial law in the Heavenly Sanctuary and the sacrifice of the Lamb of God is there recorded. Under sin, the sacrificial system is the true form of worship. It teaches us what our Saviour is doing in heaven. This is the key to a correct understanding of the Word of God. Jesus said, "Thy will be done on earth, as it is in heaven." Matt. 6:10. "It is those who by faith follow Jesus in the great work of the (blood) atonement who receive the benefits of His mediation in their behalf, while those who reject the light which brings to view this work of ministration are not benefitted thereby. The Jews who rejected the light given at Christ's first advent, and refused to believe on Him as the Saviour of the world, could not receive pardon through Him. When Jesus at His ascension entered by His own blood into the heavenly sanctuary to shed upon His disciples the blessings of His mediation, the Jews were left in total darkness to continue their useless sacrifices and offerings. The ministration of types and shadows had ceased. That door by which men had formerly found access to God was no longer open. The Jews had refused to seek Him in the only way whereby He could then be found, through the ministration in the sanctuary in heaven. Therefore they found no communion with God. To them the door was shut. They had no knowledge of Christ as the true sacrifice and the only mediator before God; hence they could not receive the benefits of His mediation." The Great Controversy, p. 430. Until the church observes the ten commandments which point out sin, and the statutes and judgments of the ceremonial law, the remedy for sin, as it is in Christ the Messiah, the world will never know what Jesus is doing for them in heaven. We know not what the Holy Trinity is doing in the Sanctuary in heaven unless we consult the law of Moses in the earthly. Jesus has said: "Elias (Elijah) truly shall first come, and restore all things." Matt. 17:11. In the name, Elijah, printed in capital letters, the I resembles a piece of I beam steel used in bridge construction and the erection of commercial buildings. It has two heads with a wide thin piece of steel in the center joining the two flat ends making an [–] beam, suggesting that Elijah represents two heads with divine vision and divine interpretation – personal representatives of The Trinity. On closer examination we see the I beam has, not only two parts, but actually three, showing a perfect union of the three making up the whole, a perfect symbol showing the relationship of the heavenly Trinity. They are Three, yet One. Each member of the Triune Godhead (Rom. 1:20), having His personal Representative on earth to the church, each having Inspiration. In 1888 we had a faint shadow or a symbol, of Three Inspired Individuals in the church at one time, in the persons of Mrs. Ellen G. White, Elders Waggoner, and Jones. Thus, Mrs. White was inspired to proclaim that they could have been in the Kingdom in two years, if all had accepted the message and respected the messengers. Since they were not all of the same family, the father, the mother, and the son, the work was hindered and the progress of the reformation halted in 1888. Not having the three members of the same family as envisioned in Eden (Gen. 2:8,22; 3:15), the Holy Spirit could not work in a mighty way. Nevertheless, 1888 pictures, in a marked manner, that which is to obtain in the final restoration in these last days. Therefore, the prophecy of Jesus was that Elijah would restore all things, everything lost through sin, even the land like Eden, eternal life without death, and true worship as John 6:47-51 and Ezekiel 36:35 say. "This land (Holy Land) that was desolate is become like the garden of Eden," shows outright that we do not need to worry; we only have to prepare to move into the ark of safety God is preparing for all. "By blood and by incense, God was to be approached, – symbols pointing to the great Mediator, through whom sinners may approach Jehovah, and through whom alone mercy and salvation can be granted to the repentant, believing soul. "As the priests morning and evening entered the holy place at the time of incense, the daily sacrifice was ready to be offered upon the altar in the court without. This was a time of intense interest to the worshipers who assembled at the tabernacle. Before entering into the presence of God through the ministration of the priest, they were to engage in earnest searching of heart and confession of sin. They united in silent prayer, with their faces toward the holy place. Thus their petitions ascended with the cloud of incense, while faith laid hold upon the merits of the promised Saviour prefigured by the atoning sacrifice." Patriarchs and Prophets, p. 353. The ceremonial law, the Testimony of Jesus, embodies the "Daily," and is restored by Elijah, the prophet. answer: Both the ceremonial and moral code of ten commandments." Selected Messages, Book 1, p. 233. Brethren, how can the church bring the world to Jesus if she fails to do what He has commanded her to do on earth as He is doing in heaven? The ceremonial law is Christ's law in the sanctuary. This law points out the blood atonement (Lev. 23:27,28; Mark 14:14,22-24; Luke 22:13,14, 19,20). Ellen G. White said that the Lord's emblems should be taken more often than once a year, on the Passover, the 15th of Abib. This is true according to the type. The two lambs which were offered daily, morning and evening, pointed forward to the Lamb of God, the Messiah. The blood of the sacrifice is offered in the Holy Place by our High Priest, the Messiah, twice daily, morning and evening. For the church that observes the commandments, statutes and judgments, the glory of God's presence in the prePentecostal power is promised! "In visions of the night, representations passed before me of a great reformatory movement among God's people. Many were praising God. The sick were healed, and other miracles were wrought. A spirit of intercession was seen, even as was manifested before the great Day of Pentecost." Testimonies for the Church, vol. 9, p. 126. Jesus said, "Think not that I am come to destroy the law, or the prophets: I am not come to destroy, but to fulfil. For verily I say unto you, Till heaven and earth pass, one jot or one tittle shall in no wise pass from the law, till all be fulfilled." Matt. 5:17,18. Jesus not only fulfilled the law of the two lambs, offered for a continual burnt offering, daily, when He was crucified at 9:00 a.m. on Friday morning, but offers His blood "Daily" morning and evening, in our behalf in the courts above. ("And it was the third hour, and they crucified him." Mark 15:25, and that same day "at the ninth hour Jesus cried with a loud voice. . . My God, my God, why hast thou forsaken me?" Mark 15:34). Why did Jesus cry out twice to God, and why did He ask, why they had forsaken Him? In the first place, there are two members of the Godhead besides Jesus, and He called to them both, God the Father, and God the Holy Spirit. When they left Him Jesus knew that He was dying. Why did the Father and the Holy Spirit both leave Jesus? Jesus was filled with the Holy Spirit from the day John baptized Him (Mark 1:9,10). He, the Son of Gods, had given His life to redeem man and it was necessary to fulfill the sanctuary law, for His blood to be mediated in the heavenly sanctuary at the time of the evening sacrifice, when the blood of the sacrifice must be offered as the seventh-day Sabbath drew on. Therefore, it was mandatory the Messiah's Father sit on His throne as the Holy Spirit, acting in the capacity of High Priest, Melchizedek, mediated the blood of the Son, the Sacrifice, in the heavenly sanctuary. Consequently, we see not only the Son involved in the sacrifice of His life to redeem man, but also, all heaven and the Triune Godhead, the whole Heavenly Family were involved. tuary by the Eternal Spirit, Melchizedek (Heb. 9:14). "Likewise the Spirit also helpeth our infirmities: for we know not what we should pray for as we ought: but the Spirit itself maketh intercession for us with groanings which cannot be uttered. . .Who is he that condemneth? It is Christ that died, yea rather, that is risen again, who is even at the right hand of God, who also maketh intercession for us." Rom. 8:26,34. "Jesus, when he had cried again with a loud voice, yielded up the ghost. And, behold, the veil of the temple was rent in twain from the top to the bottom." Matt. 27:50,51. The Holy Spirit left Jesus and ascended to the Heavenly Sanctuary to mediate His precious blood in the holy place to atone for Israel that day. As the high priest was ready to slay the lamb, the "Daily" typical evening service, at the ninth hour, 3:00 p.m., which pointed to Jesus, the antitypical Lamb, the veil of the temple between the holy and the most holy place, where the high priest was forbidden to enter except once a year on the occasion of the day of Atonement, was rent by the hand of Omnipotence, and the typical sacrifice escaped. Here was shown the transferral of the "Daily" from earth to heaven. "The cleansing, both in the typical and in the real service, must be accomplished with blood: in the former, with the blood of animals; in the latter, with the blood of Christ . . . .And what was done in type in the ministration of the earthly sanctuary is done in reality in the ministration of the heavenly sanctuary." The Great Controversy, pp. 417, 418, 420. The time has come for the Investigative Judgment of the Living in the house of God (1 Pet. 4:17). The Lord sends Elijah to restore all things. It is likely that we have entered the Judicial phase of the Judgment with the Executive phase (Eze. 9:5-11) to follow quickly. The nations are being prepared for the Loud Cry of the Third Angel's Message. E. G. White: "I saw angels hurrying to and fro in heaven, descending to the earth, and again ascending to heaven, preparing for the fulfillment of some important event. Then I saw another mighty angel commissioned to descend to the earth, to unite his voice with the third angel, and give power and force to his message. Great power and glory were imparted to the angel and as he descended, the earth was lightened with his glory." Early Writings, p. 277. An angel is commissioned to descend to the earth with a message to join the Third Angel giving power and force to his message. 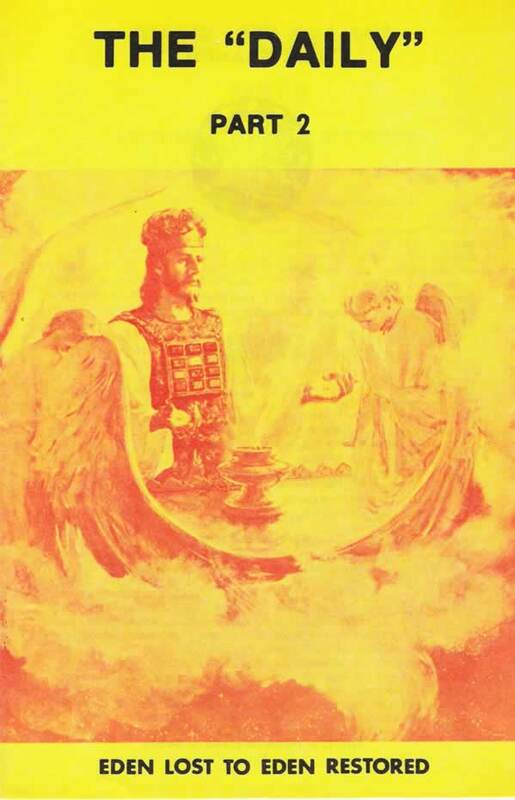 The Third Angel's Message is the Sabbath and Sanctuary truth. The mighty angel comes with a present truth application of Sanctuary law, the ceremonial, adding the light of the "Daily" service, giving power and force to the Third Angel, the fulfillment of God's promised glory to those that meet with Him "Daily." The glory of the Holy Spirit joins the Messiah in a message to be given to the world. These events purify the church. WARNING: Without a knowledge of the Holy Spirit as our Intercessor to make efficacious the precious blood of Christ, our Intercessor (G.C. 415), we cannot approach God (P.P. 353; Rom. 8:26,34).